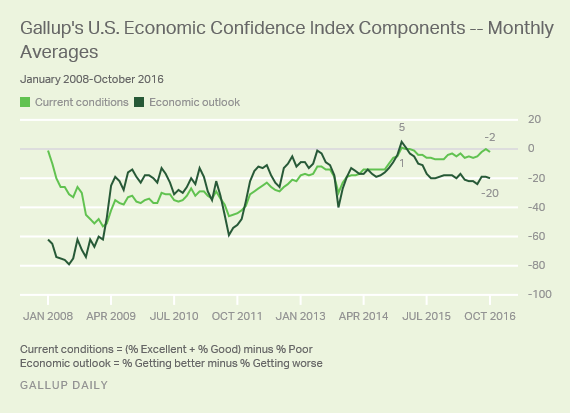 Americans’ confidence in the economy declined slightly in September, with Gallup’s U.S. Economic Confidence Index slipping to +4 from August’s reading of +6. 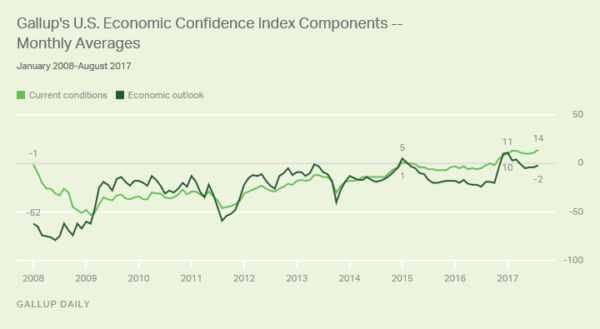 Gallup’s U.S. Economic Confidence Index is the average of two components: how Americans rate current economic conditions and whether they believe the economy is improving or getting worse. The index has a theoretical maximum of +100 if all Americans were to say the economy is doing well and improving and a theoretical minimum of -100 if all were to say the economy is doing poorly and getting worse. The current conditions component measured +13 in September, the result of 34% describing the economy as “excellent” or “good” minus the 21% describing the economy as “poor.” September’s current conditions score essentially ties the +14 observed in August — the highest monthly reading in the 2008-2017 Gallup Daily tracking trend. However, economic expectations dimmed slightly in September. Over the course of the month, half of Americans said economic conditions were “getting worse,” while 44% said conditions were “getting better,” resulting in an economic outlook score of -6. This is down four points from August’s -2 outlook score — but, as was the case with the overall metric, was no different from how this component performed in the final half of August. In the first half of August, by contrast, the economic outlook component was neutral, meaning it averaged a score of 0. This entry was posted in Uncategorized and tagged Gallup on October 3, 2017 by Ted Kavadas. 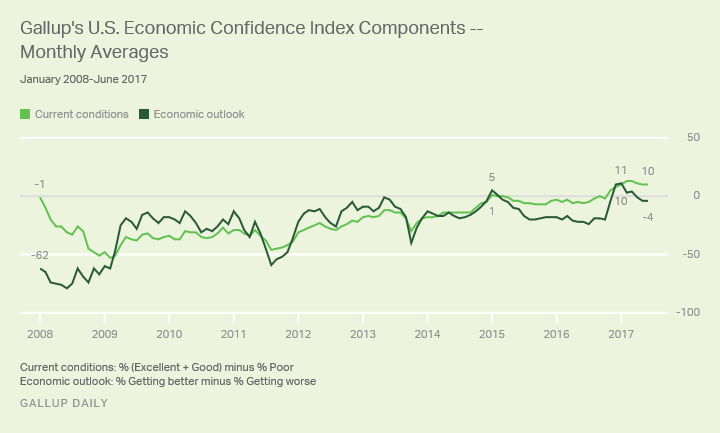 Gallup’s U.S. Economic Confidence Index is the average of two components: how Americans rate current economic conditions and whether they believe the economy is improving or getting worse. The index has a theoretical maximum of +100 if all Americans were to say the economy is doing well and improving, and a theoretical minimum of -100 if all were to say the economy is doing poorly and getting worse. Last month, 35% of Americans described current economic conditions as “excellent” or “good,” while 21% assessed them as “poor.” Overall, the current conditions component of Gallup’s U.S. Economic Confidence Index stood at +14 for the month, slightly better than July’s +11 and the highest monthly average for this component since 2008. Slightly more Americans, meanwhile, continued to say the economy was “getting worse” (48%) than “getting better” (46%) in August. This leaves the economic outlook component at -2 for the month, essentially no different from its performance in July (-4). This entry was posted in Uncategorized and tagged Gallup on September 5, 2017 by Ted Kavadas. 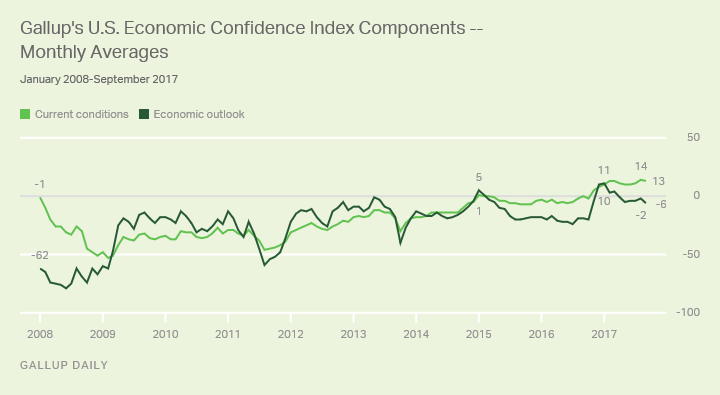 Americans’ confidence in the economy was steady last month, with Gallup’s U.S. Economic Confidence Index averaging +4 in July. This score is nearly identical to the 2017 low of +3 registered in May and June. 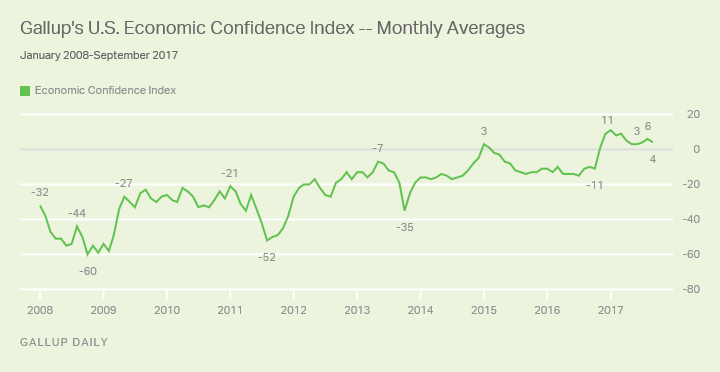 Still, July marked the ninth consecutive month that Americans rated the economy more positively than negatively — the longest such streak since Gallup began tracking economic confidence in 2008. Last month, Americans continued to see current economic conditions positively, with 33% describing the economy as “excellent” or “good,” compared with 22% describing it as “poor.” This leaves the current conditions component at +11 for the month — nearly identical to its performance in June (+10). In July, the greater share of Americans continued to see the economy as “getting worse” (49%) rather than “getting better” (45%), as has been the case since May. As a result, the economic outlook component equaled -4 last month, on par with May (-5) and June (-4). This entry was posted in Uncategorized and tagged Gallup on August 2, 2017 by Ted Kavadas. 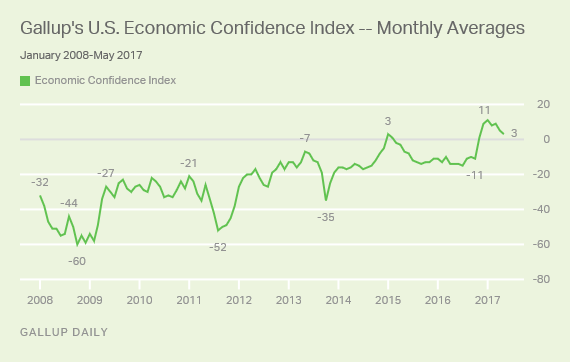 Americans’ confidence in the economy remained at a 2017 low in June, with Gallup’s U.S. Economic Confidence Index averaging +3 for the second month in a row. Despite confidence lagging below January’s monthly record high of +11, June nonetheless marked the eighth consecutive month in which U.S. adults rated the economy positively. Last week, Americans’ confidence in the economy averaged a score of 0, the first time in the 33 full weeks since the presidential election that the index’s weekly average was not positive. However, this may be more of a fluke than a harbinger — lower scores in the middle of the week dragged down the weekly average. They returned to previous levels by the end of the week. Last month, Americans continued to view current economic conditions positively, with 33% describing the economy as “excellent” or “good” compared with 23% describing it as “poor.” This leaves the current conditions component at +10 for June, identical to its performance in May. For the third month in a row, however, a slightly larger share of Americans (49%) said the economy is “getting worse” than said it is “getting better” (45%). This puts the economic outlook component at -4 in June, in line with its May reading. This entry was posted in Uncategorized and tagged Gallup on July 5, 2017 by Ted Kavadas. Though still historically high, Americans’ confidence in the economy fell to a six-month low in May, largely dragged down by Democrats’ worsening economic attitudes. 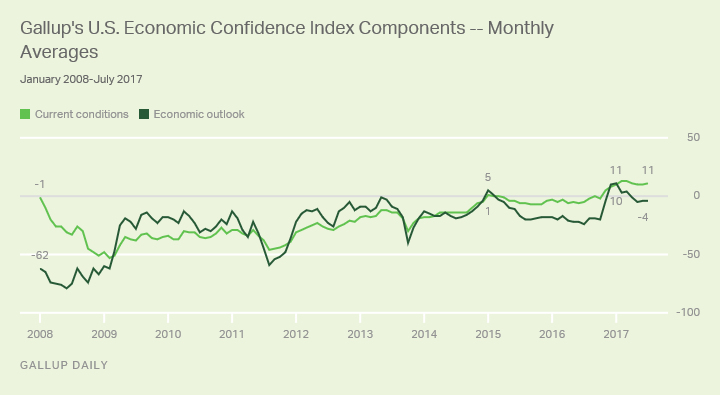 Gallup’s U.S. Economic Confidence Index averaged a score of +3 in May, down slightly from April (+5) but eight points below January’s record monthly high (+11). Even as some Americans become more pessimistic about the economy overall, attitudes about the economy’s current conditions have been relatively stable. Last month, 32% of Americans assessed the economy as “excellent” or “good,” while 22% said the economy was “poor.” Overall, the current conditions component averaged +10 in May, similar to +11 in April and three points shy of the nine-year high (+13) the measure hit in February and March. Meanwhile, perceptions about the economy’s outlook have more clearly deteriorated. In May, slightly more Americans (49%) said the economy was “getting worse” than said it was “getting better” (45%). The economic outlook component stood at -4 for the month, representing a slight dip from April when the component averaged -1, and it is down notably from its record high in January of +11. This entry was posted in Uncategorized and tagged Gallup on June 6, 2017 by Ted Kavadas. 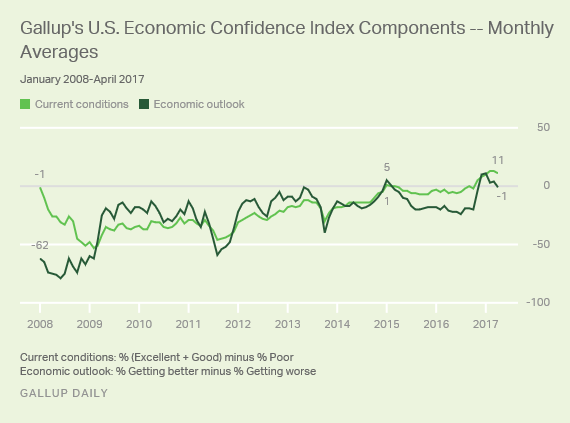 Americans’ economic confidence weakened slightly in April, but they remain positive about the current state of the U.S. economy. Gallup’s U.S. Economic Confidence Index averaged +5 in April, down four points from March’s average. Despite the dip, confidence has been in positive territory for six consecutive months — the longest such streak in the past nine years. 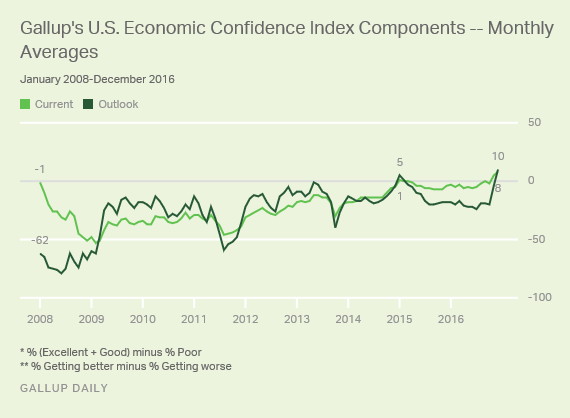 Gallup’s U.S. Economic Confidence Index is the average of two components: how Americans rate current economic conditions and whether they feel the economy is improving or getting worse. The index has a theoretical maximum of +100 if all Americans were to say the economy is doing well and improving, and a theoretical minimum of -100 if all were to say the economy is doing poorly and getting worse. In April, 32% of Americans rated economic conditions in the country as “excellent” or “good,” while 21% rated conditions as “poor.” This left the current conditions component of the index at +11 for the month, down slightly from March’s +13. Meanwhile, 46% of Americans said the economy was “getting better” in April, while 47% said it was “getting worse.” Because of this, the economic outlook component fell to -1 from +4 in March. This entry was posted in Uncategorized and tagged Gallup on May 2, 2017 by Ted Kavadas. Still, Americans’ economic confidence has remained positive overall for 20 straight weeks — since the week after the presidential election in November — making it the longest positive streak since Gallup began tracking the measure. In March, one-third of U.S. adults (33%) described economic conditions as “excellent” or “good,” while 20% rated them as “poor.” This resulted in a current conditions score of +13 for the month — the same as in February. Meanwhile, 49% of U.S. adults said economic conditions were “getting better,” while 45% said they were “getting worse,” resulting in an economic outlook score of +4 — similar to February’s +3 for this component. This entry was posted in Uncategorized and tagged Gallup on April 4, 2017 by Ted Kavadas. 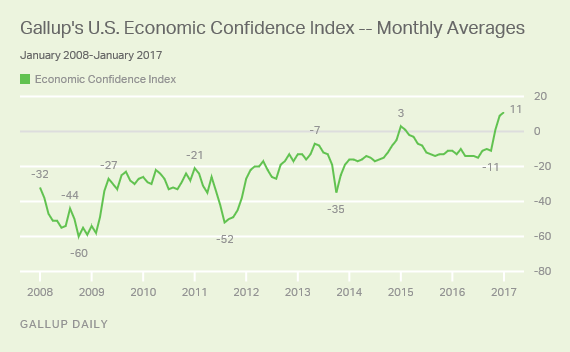 Americans’ confidence in the U.S. economy remained strong in January. 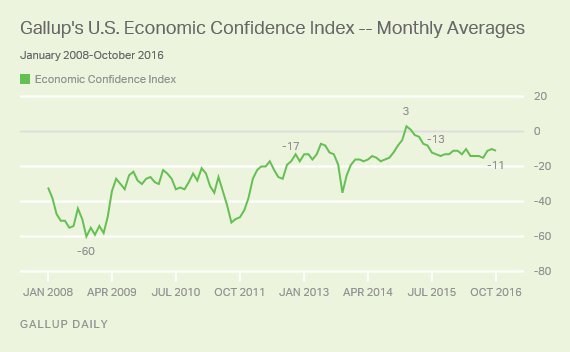 Gallup’s U.S. Economic Confidence Index averaged +11, the highest monthly average in Gallup’s nine-year trend. However, the index has been slightly lower so far in February. In January, 31% of Americans rated the economy as “excellent” or “good,” while 21% said it was “poor,” resulting in a current conditions score of +10 — marking the highest monthly reading for this component since 2008. This entry was posted in Uncategorized and tagged Gallup on February 7, 2017 by Ted Kavadas. 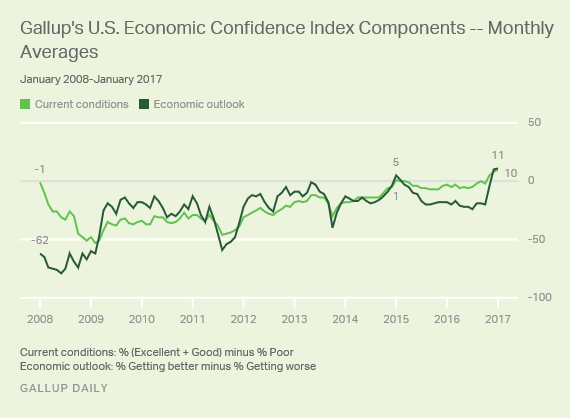 Americans ended 2016 with higher confidence in the U.S. economy than they have expressed at any other point since 2008. 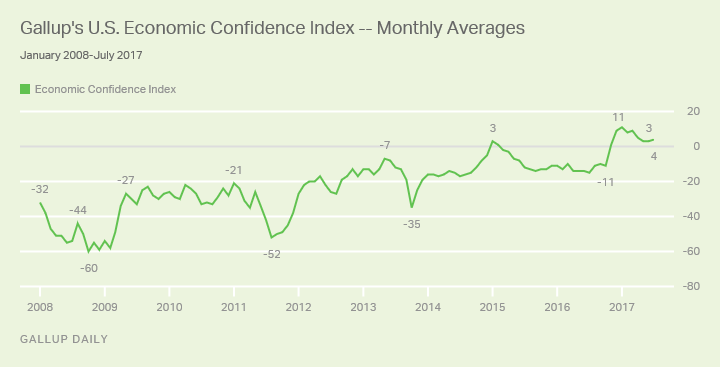 Gallup’s Economic Confidence Index averaged +9 in December, up eight points from November. In December, 30% of Americans rated the economy as “excellent” or “good,” while 22% said it was “poor,” resulting in a current conditions score of +8. This was up from November’s +5 current conditions score and marks the highest reading for this component since 2008. This entry was posted in Uncategorized and tagged Gallup on January 3, 2017 by Ted Kavadas. Americans’ confidence in the U.S. economy has been stable for three months since the Democratic National Convention held in late July helped boost assessments of the economy. The index averaged -11 in October, similar to the -11 and -10 recorded in August and September, respectively. In October, about as many Americans said the economy is “excellent” or “good” (27%) as said the economy is “poor” (29%), resulting in a current conditions score of -2. Americans’ assessments of the current state of the economy are about as positive as they have been in the past eight years; the best score for this index component is +1, recorded in January 2015. Americans remain much more negative about the direction the economy is headed. Thirty-eight percent believe the economy is “getting better” and 58% say it is “getting worse,” resulting in an economic outlook score of -20. This index component has fallen sharply since reaching its post-recession high of +5 in January 2015, though it has held steady over the past several months. This entry was posted in Uncategorized and tagged Gallup on November 1, 2016 by Ted Kavadas.